Warner Home Video gave a Blu-ray debut to a powerhouse horror classic on Oct. 5, 2010, in time for Halloween. The Exorcist Extended Director’s Cut was released as a two-disc Blu-ray Book and new DVD. Warner remastered The Exorcist in 1080p high-definition from the original camera negative. The Blu-ray ($34.99) contains both the theatrical version and the Extended Director’s Cut, which was released in 2000. The DVD ($19.96) will have only the Extended version of the movie. Directed by William Friedkin (Oscar winner for The French Connection), The Exorcist stars Linda Blair as a girl possessed by a demon. Her mother (Ellen Burstyn) seeks help at a church and when a priest with a mysterious past (Max Von Sydow) shows up, a battle for the girl’s soul begins. The 1973 movie, based on the best-selling novel , won Academy Awards for Best Adapted Screenplay and Best Sound and was nominated for eight other categories, including Best Picture. 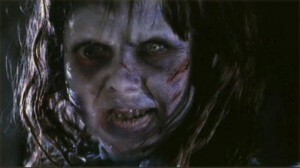 According to Warner, The Exorcist is one of the top 10 box-officer performers of all time. Raising Hell: Filming the Exorcist — set footage produced and photographed by Owen Roizman, camera and makeup tests, and interviews with Friedkin, Blair, author/screenwriter/producer William Peter Blatty and Roizman. Faces of Evil: The Different Versions of The Exorcist — with Friedkin and Blatty discussing the different versions of the film and featuring outtakes from the film. and trailers and TV spots for both versions of the movie. The Blu-ray Book is packaged with a letter written by Friedkin inside a 40-page Digibook of photos, cast bios and production notes. The same day as its disc release, The Exorcist also was available on demand from cable and satellite providers and for permanent download or rental through iTunes, Amazon Video On Demand, PlayStation Store and Xbox Live Zune Video Marketplace.